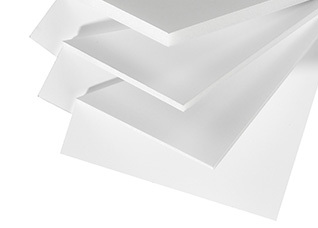 ACI rigid lightweight foam with core board insulation, is a lightweight extruded polystyrene core lined on both sides with a white clay coated paper, it can be printed, laminated, & die cut. Its many uses include signs, POP displays, exhibits, & framing. These products are used for a host of indoor signage and Point-Of-Purchase applications. Non-Memory (“Pillowing”); allows the edges to stay compressed to create an embossed look, or crimp the edges to create a clean unexposed edge after die cutting. Memory (“Non-Pillowing”); which allows the edges to re-expand almost to the original thickness, after die cutting. There are also a number of product variations including foam boards with adhesive (pressure sensitive) or heat-activated coatings as well as those that have laminate surfaces in expanded PVC, styrene and metals. Biodegradable foam board is also available. As well as Foam Board being used for signs, P.O.P displays, exhibits, & framing. Foam board is also an ideal insulation board. Extruded polystyrene provides superior moisture resistance, and it is also lightweight, rigid, warp resistant, easy to handle, and easy to install. It is a lamination of foam and smooth surface, clay coated, paper stock. Boards, textiles and acid free paper can be laminated to the surface by either dry or wet mounting techniques. Our foam boards can pasted together to create more rigid and thicker boards.